We are here today again to celebrate. To speak out for freedom. To speak out for how we should relate to each other and embrace the fundamental American notion that we are all equal. Mayor. Pastor. All of you, thanks for letting me say a few words. I want to start by saying how proud I am of the Carver Museum. I agree with the Mayor that it’s a gem. I also would be remiss if I didn’t say thanks to the Legislative Black Caucus for its work that helps make today possible. Just a week ago, we were all together in our annual parade celebrating Juneteenth. It’s always a wonderful day. Great happiness. Bands playing. People dancing in the street. Friends crying out to friends. Kids grabbing candy. Politicians . . .well, politicking. This year was much the same. I loved every minute of it. But there was a shadow. This year’s Juneteenth Celebration was in the context of a horrific crime in South Carolina. And I will tell you, right now, even as I stand here, I’m almost unable to believe it. I tell you I can’t fully wrap my mind around such hate. I still grieve. I’m still so angry. I’ll admit that yesterday I got so emotional watching our President invoke the grace of God as he led us in song. We do it by dedicating this reminder. This monument. 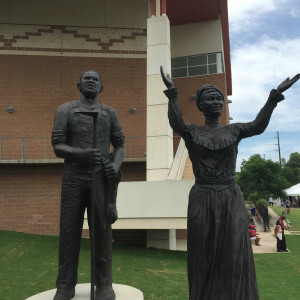 Even as other statues should be doomed to historical archives, these statues are a forceful reminder of how far those who truly love freedom and equality have come, yet we know how far we must still go. How much work is still needed to be done. How much we continue to need to call on the grace of God. As we enjoy this wonderful moment and marvel at this great work of art and a tribute to people, let us recommit ourselves—as individuals, as Austinites, as Texans, as children of God—to strive on to finish the work we are still in. God Bless You. Thank you for letting me speak and be your senator.